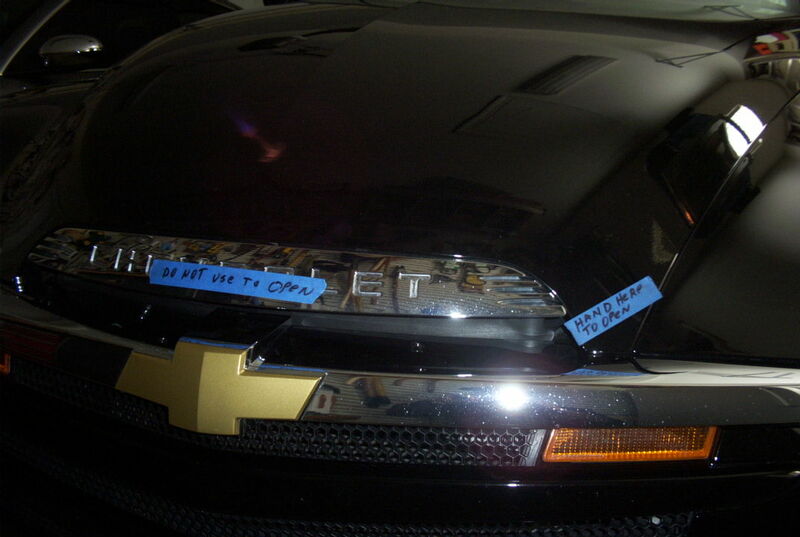 Has anyone else had a problem with the Chevy insignia on the hood breaking. Had my oil changed last week and the mechanic broke it! Anyone have any ideas to prevent this? I have glued mine with 2 or 3 coats of Gorilla glue and it has held up quite well. Get some "J-B Weld Quick" and just put the pieces back to gather with a big glob under each of the bolt pieces, works great and strong. I put masking tape on one side and stand the whole piece vertical, the Quick will be hard in about 5-10 min. I applied fiberglass and painted it with resin to beef up the rear of the trim piece. Especially the angles that are part of the screw attachment. That is a weak spot and needs reinforcement or it will be broken by most folks that grab hard at things without regard to the hood as they slam it shut. I posted photos of the repair I did, use the search engine to find a lot on this problem and the fixes. "Babe" '06 Pacific Blue/Chrome/6pd #22407, born 10/14/'05, and #21393, died 2/16/'07. What good is that going to do. Now a days, most young mechanic don't give 100% unless s/he is the owner or is inline for a promotion. Although this won't help an already broken emblem, I make a point of lifting my hood by the two steel front hood edges, and tell any technician to do the same. I also advise not to slam the hood, just push it down to the catch and give it one more gentle push to secure it. Thanks everyone, they found a new one and I'm all set. Already repaired the damaged one and now have a spare. Thanks again for all the great input!! Do you know where they found it? ours is broken now. UV SSR 141mph on the Dyno 262 RWHP My other SS is an HHR SS "The RED ROCKET" "Tuned by CJ"
One more step to a better fix of the hood emblem, be sure to scrape the plating off about a 1/4 inch around the area to be fused so the adhesive you use can bond to the plastic. A mime that Laughs out Loud is just……..
Where is it broke?, I have repaired 2 and got to know the weak spots. I can look at yours and be glad to help. "Although this won't help an already broken emblem, I make a point of lifting my hood by the two steel front hood edges, and tell any technician to do the same. I also advise not to slam the hood, just push it down to the catch and give it one more gentle push to secure it. " I go one more step, I carry three peices of blue masking tape with "DO NOT USE TO OPEN !" that I put on the hood emblem, and two that say"HAND HERE TO CLOSE !" that I put on the hood edges. I put these on the hood each time I take it to the dealer or for service. That is a great idea. they break ours every yime that we take it to the shop. I did not know this was a problem until now and mine is at the paint shop, having the CHEVROLET filled in, I will address this when it returns. Would a thin strip or of aluminum or two strips epoxied to the back help reinforce the piece?? I liked Beach potatoes fix with fiberglass but I'm not sure how thats done, never used it before. I just bought my SSR - had the Chevrolet emblem in the trunk! They said it happened on the lot. Now I know they broke it opening the hood. Fortunately they glued it on after the sale, but now it's coming off again. AARRGGHH! I too broke mine. The first time I used acetone to glue it back together and braced it with a bead of J-B weld around the broken edge. It held for several months until I forgot and pulled on it. This time I scraped the plating off around the crack and feel the bond is better. so far so good. In your case maybe a bead of J-B weld applied to the bare plastic at the corners might help. Don't do as I did and forget and pull on the trim. I purchased my 2005 SSR in March 2011 and I went to lift the hood and the emblem fell off in my hand.I took the bolt on parts(Brackets) off of the hood and sanded inside of each of the brackets and on the inside of the emblem where these brackets fit to the emblem and I filled them with QuikSteel,a Steel Reinforced Epoxy Putty that resembles a roll of Play-Doh.After sanding all three of the pieces with the bolts(Brackets) that holds the emblem to the hood and after sanding three small spots on the emblem,I fit the pieces in their correct locations and filled the gaps between the emblem and the brackets with this QuikSteel putty and it is now one solid piece where the bracket is.It seems to be holding pretty good and there is no way for it to flex or give if handled by the un-knowing mechanic.From what I hear there are several pieces on our SSR's that need to be handled gently. Do not forget to tell the tech not to touch the emblem......also advise them how to close the cargo lid if they ever need to get into that area. My emblem broke off about 4 years ago. I used E6000, which is an adhesive you can get at the craft store for under $5.00. I live outside Richmond, Va., and the past couple of winters have been cold, snowy and icy. And we have hot and humid summers. This stuff even holds up good in the car wash. Check with Mike at Simple Engineering he is making a fiberglass reinforced piece to go under the emblem and secure it. It use to be made by someone call ZZR or something like that. Mine had been broken and repaired before I got the SSR. The previous owner told me about it so when I needed to have a new rack and pinion I knew they would have to service the power steering so I removed it before dropping the SSR off.